Osgood-Schlatter Disease occurs wherein the immature skeleton, the head of the shinbone, or tibia, is not fully fused with the long midsection of the bone, and lying between these two sections is a growth plate from which new bone is formed, thereby allowing longitudinal growth. Around the age of 5-10 years, a protrusion forms just below the head of the shinbone, and this is called the tibial tubercle. 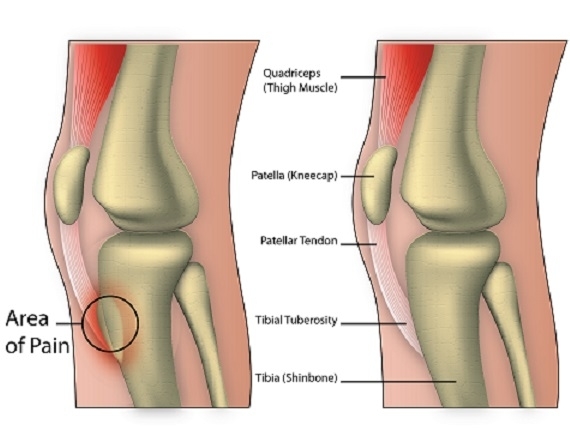 The tibial tubercle acts as a secondary bone-forming (or ossification) centre, with the aforementioned growth plate being the primary centre It is also the tibial attachment point for the ligament originating from the quadriceps muscles and connecting the kneecap (the patella) to the shinbone, called the patellar tendon or ligament. Osgood-Schlatter disease, named after Robert Osgood and Carl Schlatter who first described it in 1903, is commonly seen in active adolescents and is a common cause for pain behind the knee for young athletes. While the exact mechanism by which it is initiated are not fully established, it is widely believed that the disease is an overuse injury caused by traction or pulling forces acting on the tubercle by the patellar tendons that are connected to the quadriceps muscles. This can lead to significant inflammation and pain. This disease usually occurs in boys between the ages of 12 and 15 years, and girls between the ages of 8 and 12 years, during the adolescent growth spurt, and up to 30% of patients are affected in both knees. Nearly 50% of patients are involved in sports, with research finding that athletes that specialize in one sport being affected four times greater than those that take part in multiple sports. Participation in sports, especially in a single sport rather than multiple sports. Adolescents in the growth spurt phase (on average, between the ages of 10-14 years). Diagnosis of Osgood-Schlatter Disease is usually made based on medical signs and reported symptoms. This includes palpation of the tibial tubercle to assess tenderness, swelling and localized pain. It is advised, however, to obtain plain radiography to eliminate other possible injuries or disorders. Non-surgical treatment for Osgood-Schlatter Disease is typically results in good recovery, with rest, ice, analgesia (acetaminophen and non-steroidal anti-inflammatory drugs (NSAIDs) and physical therapy being the main components of the treatment plan. Improving on the flexibility of lower extremity muscles have also been shown to reduce symptoms. Knee orthoses/braces can also be used to reduce the stress exerted by the quadriceps on the tibial tubercle. Immobilization is only recommended for non-compliant patients, or for those with severe pain, for which immobilization for 2 to 3 weeks may be advised. This disease is not expected to occur once the skeleton matures and the tibial growth plate fuses with the long midsection bone of the shinbone, so there should be a full recovery by this time. There are cases, however, where adults have recurrent symptoms and may, therefore need surgical treatment. Pallin, D., and Lyn, E., (Eds.) (2010) The Knee, Mosby Elsevier, Philadelphia. Steen, O. T. (1945) Significance of Recurrent Osgood-Schlatter Strain, Can Med Assoc J 53, 468-471. Maher, P. J., and Ilgen, J. S. (2013) Osgood-Schlatter disease, BMJ Case Rep 2013. Atanda, A., Jr., Shah, S. A., and O’Brien, K. (2011) Osteochondrosis: common causes of pain in growing bones, Am Fam Physician 83, 285-291. Hall, R., Barber Foss, K., Hewett, T. E., and Myer, G. D. (2015) Sport specialization’s association with an increased risk of developing anterior knee pain in adolescent female athletes, J Sport Rehabil 24, 31-35. Jakob, R. P., von Gumppenberg, S., and Engelhardt, P. (1981) Does Osgood–Schlatter disease influence the position of the patella?, J Bone Joint Surg Br 63B, 579-582.